How long has that house been on the market? As an active buyer searching for your next home; in what we are constantly being told is a very tight property market, with an acute shortage of property, you might be surprised to learn that across the country half of all the properties on the market today have been for sale for more than 3 months. In fact 1 in 4 of all properties for sale today have been on the market since before Christmas! The fact is, as with everything these days we tend to focus on the new, the latest and the current. We tend to look no further than the first page online when it comes to search results and property searching. Step beyond the first 3 pages on Realestate.co.nz and you will discover another 1,923 pages (20 properties to a page) full of properties all fighting for your attention. I was drawn to examine the make up of the stock of properties on the market when I saw quoted the other day the fact that in the UK 25% of homes on the market had been on the market before Easter. A fact I found amazing. It prompted me to examine the extent to which this was true in NZ. The fact is in NZ overall close to 40% of all properties were on the market before Easter. About 25% of homes on the market today were on the market before Easter. This classic long-tail is more acute outside of the main 3 cities of Auckland, Wellington and Christchurch. Across provincial NZ there are currently over 27,000 properties for sale of which less than 1 in 5 were added in the month of September, with 6 out of 10 being listed more than 3 months ago. So much for the belief that the typical “days to sell” measure as reported by REINZ in August was 38 days! The fact is that a lot of properties take a long while to sell and often are re-listed more than once by a different real estate agent. It is only the final selling agent that declares to REINZ the days-to-sell as to how long it took them to sell the property from the date of the listing agreement, not how long the average house takes to sell from first listing day to final unconditional contract. Some markets though do exhibit a very different distribution of aged-property. At the other extreme Christchurch exhibits a very different make up of property for sale on the market. In this much tighter market where less than a third of all properties have been on the market for more than 3 months and properties listed for more than a month only represent 58%, compared to 82% across provincial NZ. Auckland as would be expected has a high proportion of newer listings, but in fact lags considerably behind Christchurch. Again despite the constant commentary about the shortage of listings, fully 1 in 8 of all properties on the market today have been for sale since Christmas, fully a third have been on the market for more than 3 months. For Wellington its inventory of property for sale totalling 2,362 listings has 45% of all listings - a total of over 1,000 properties that have been on the market for more than 3 months and similar to Auckland 1 in 8 (over 300 properties) have been on the market since Christmas - as yet unable to find a buyer. It has been a constant refrain of the property market commentary for many years - "there is a shortage of property on the market"; "property shortages driving up prices" etc. The reality is that compared to 2008 there is a shortage. In that year there were 163,488 properties listed for sale and sales totalled 56,071 indicating a clearance rate of just 34%. Compare those figures to the latest data showing that in the past 12 months just 130,307 new properties listings were added to the market. Sales over the past 12 months to June 2014 have totalled just 76,637 indicating a clearance rate of 57%. Simply put more of the properties that are listed today are selling than in 2008 and the number of properties listed is down significant;y. However as with all statistics, every conclusion you draw is influenced by the data set you choose. 2008 as we all know was the start of the Global Financial Crisis and the worst year for NZ property for many generations. Judge anything against those days and the picture will be skewed. If on the other hand you line up the data for the first 6 months of each of the past 7 years for which data is available, the picture is very different. (Note there is no listings data prior to 2007). Total property listings for the first 6 months of each of the past 6 years have barely changed. This year, total listings have reached 63,436 properties listed for sale; hardly any change from last year or the prior year, 2010 saw a bit of a rise in listings. So to say we have a shortage of listings is stretching the truth. The fact is that we now operate in a very stable supply market. Much as real estate agents may wish to see more properties on the market, the fact is levels in 2007 and 2008 are purely historic fact not a target to be achieved. Even in Auckland where the pressure in the property market is judged to be felt the worst, listings are barely changed comparing this year to last or in fact any of the past 6 years - the Auckland property market is experiencing a steady supply of new listings. So steady that you could be fairly confident that the balance of 2014 will see a further 22,000 properties listed between July and December. Clearly the number of new listings alone does not tell the whole story of the property market, especially in regard to pressure of demand on even a stable supply and so to the above stats you need to represent the level of property sales as in the chart below. Across the country in the first 6 months of this year total sales have reached 36,164 down 11% as compared to the first 6 months of 2013, whereas listings have barely changed. In terms of a clearance rate in these first 6 months of this year the total sales of 36,164 represent, as noted earlier 57% of the new listings. A year ago the figure based on the first half of 2013 was 62% indicating that there is less success in property sales and therefore clearly no shortage. Focusing on the Auckland market there is no doubt that here the clearance rate of property is far higher. For the first 6 months of this year a total of 15,090 properties have been sold with a total of 21,002 new listings - a clearance rate of 72%. The same time a year ago the clearance rate was 78% indicating the easing in any pressure in this market over past year with that steady supply and slowing sales - therefore no shortage! The mobile property searching environment has become a little more heated with the launch of a significant campaign promoting KiwiBank's Home Hunter app for iPhone and Android. The app was originally launched late last year but seemed at the time to suffer from data integration issues which have now been fixed and with that has come this recent promotion. It is by no means the only foray into this space by the main retail banks eager to establish closer relationships with home buyers. ASB launched an app back in 2012 which was based on the data from QV which was a rather weak experience and appeared to 'wither on the vine' - I still have it on my iPhone but its lack of data integration leads to it crashing - it is also not in the app store. It is interesting as an example of how to manage the retirement of an app as of course the actual app lives on even when you delete it from the store and your brand therefore is tarred with the implied experience of it not working! Westpac have been active in this space but rather than build an app chose to partner with both Realestate.co.nz and Trade Me Property to sponsor those apps. They also in my mind built an excellent service called Home Club which with a data integration with Trade Me Property enables the user to scrapbook properties and receive property insight data from QV. The Home Hunter app from KiwiBank works well as far as data integration which it receives through a data feed from Realestate.co.nz which provides the most comprehensive portfolio of agent listings. However I struggle to see the value in the app for the general property "hunter", except for one very sweet aspect. I believe that the team at KiwiBank (I use the term specifically as there is a Facebook page for the team!) have rushed off in their excitement to develop the app, grabbed some "shiny objects" along the way but have not stopped to think about the user and what the user might find useful. Here is my take on the app - the pros and cons. 1. Shiny object #1 - the name 'home hunter' goes along with the functionality of the augmented reality capability that allows you to see property around you overlayed with details of property for sale. There is a small circular 'radar' image that tells you if you are near to property for sale. However the whole experience is a classic case of a technology seeking a solution - you have to ask yourself do you want to walk around holding your phone up in front of you? The better solution is the map based presentation of Realestate.co.nz - better to have people look down at a map of where they are and see what is around them for sale. (As a friendly note to KiwiBank, there is a terrible unexpected consequence of this feature; if as I did, you give up using this feature from the drop down menu and close the app, when you next start the app again you immediately think something is wrong or broken because all you get is the phone's camera with no context of the app). 2. Shiny object #2 - the sun finder feature is one of those functionalities that you go "interesting to know but not something I need everyday!" - it shows the trajectory of the sun relative to the time of year wherever you are standing. Now maybe I am wrong, but not really that compelling; after all what you need to know is where is north and any Sky satellite dish will tell you that. 3. Sweet Honey - the app will provide you with an estimated price range for every property on the market - now that is compelling and appealing! However. yes there always has to be a however; you need to get a pre-approval from KiwiBank. Now I would think if I was thinking of buying what harm could there be in being pre-approved? After all the estimated price range for every property you look at that is on the market is compelling and considering the cost of a one-by-one request of QV for this data would be $49.95, the trade off of 10 mins of your time and providing your details to KiwiBank as compared to hundreds of dollars of cost for multiple property e-valuer estimates, is a no brainer - where do I apply? Added to this KiwiBank highlight with a little green tick properties that in principle they would lend against. 4. Dead end - the app despite having all this rich set of listings of property on the market and estimated price range, fails at the core benefit of a tool to find property for sale and to contact the agent. Instead of having the agent details on each listing, the app has to open up the whole listing as a app browser-window from Realestate.co.nz for you to have to scroll down to find the agent contact details within that listing. 5. Disorientation - I have in the past bemoaned the Trade Me Property app as it does not put the map based search front and centre on its app, burying it as a secondary functionality. Almost 100% of real estate mobile apps the world over (inc Realestate.co.nz) launch into a map. It's logical. It's a mobile device with built in GPS. Sadly KiwiBank goes one huge leap backwards and has no map on their app! So in summary, this Home Hunter app has one killer piece of functionality that in my view outweighs a stack of poor user delivered functionality. So if you are serious about buying, get a pre-approval and use the app from your desk at the office or at home, and then when you are out an about to view property use the Realestate.co.nz app. As an extra piece of insight I thought I would have a look at the level of downloads for this app as compared to the main portal apps. The chart below tracks (via App Annie) the ranking of downloads of the 3 apps over the past 30 days. Clearly the advertising campaign is working for KiwiBank, they are the most downloaded app for property at this time. For Realestate.co.nz it's a steady rate of downloads on top of the more than 200,000 to date, whereas Trade Me Property whilst benefiting from a spike in downloads after the relaunch in April, is struggling a bit in 3rd place. I can't blame newspapers / media sites / sub-editors or journalists for eye-catching headlines - they need to attract an audience and sell advertising to that audience, and there is no better headline than the combination of property and greed, or is it simply kiwi can-do attitude! "Owners make $220,000 in a year"
However this article in today's NZ Herald is at best light on fact and rather heavy on drama. "A plain weatherboard house on Auckland's North Shore sold last week for 94 per cent more than its current valuation" - the fact is it the property sold for $876,000; its 2011 Auckland assessment capital value was $455,000. It's current valuation is either the sale price of $876,000 or the valuation assessment made by a registered valuer. So it did not sell for close to double its current valuation. "Owners make $220,000 in a year" - the difference between the sale price in March 2013 and the sale price in May 2014 is $226,000, no allowance seem be allowed for in any costs associated with owning or selling the property. As I will show below the owners made around $70,000. "A real estate source said the sale showed there was "no sign of the market slowing up" in Auckland" - a single property sale can never be extrapolated to reflect the property market dynamics of the whole of Auckland. I could so easily have stopped the article there, but could not help myself when I saw this article to do some research and see what I can assess is the real story here. The property concerned is at 13 Benders Avenue, Hillcrest - with the services of Google Maps StreeetView it takes no time these days to verify a property from a street image. The property was sold at Auction just over a year ago on the 7 March 2013 for the price of $650,000 it was marketed by Bayleys. The marketing copy described the property as "An original immaculate example of what was a modern 60's bungalow set on a near-level, full road frontage section of 954sqm"... with the ability to create and add value"
It was very clear from viewing these images of the property just over a year ago that it was indeed an "original" and in need of renovation - a full portfolio of images is available to view via Open2view here. Over the course of the past year the owners have carried out a classic do-up to improve the appeal of the property as the 'Before & After' images below demonstrate. The property has been recently marketed by Barfoot & Thompson and went to auction on the 8th May and sold for $876,000. In my judgement the owners carried out an appropriate make-over to the property to present it in excellent condition which naturally creates appeal and demand and that was demonstrated by the fact that the auction was brought forward. However that headline keep nagging at me - did the owners really make $220,000 in a year. So here is my assessment of the facts based on my estimation. Not $220,000 but overall a healthy return in a year of over $120,000 representing a 94% return on the original investment of the deposit of $130,000. However I think what we have presented here is what the IRD would judge to be a property purchased with the intention of sale and thereby deemed to be a business. The mitigating factors being the property was only owned for a year, it was significantly renovated over the year and it was clearly staged for sale and therefore unoccupied. So legitimately the owners have seen a net profit of just around $70,000 giving a 54% return on the original investment of the $130,000 deposit for just a years worth of work, and the government collected $34,000 of tax on earned income. The property is now a far more attractive home for its new owner. The local community has benefited from the trades people employed to do the work, local real estate agents have earned their income for their work and the owners are rewarded for their risk in this business decision. So who loses? - the new owners were not forced to buy; based on their evaluation of the property market they felt that the property was worth $876,000. Potentially it could be argued that the new owners will have a mortgage that is sourced from overseas funds and this costs the country, otherwise the domestic economy benefited as well as the government. Is there really a shortage of properties for sale? We have been seeing statements in the media for years now, stating how we have a shortage of properties for sale - ever since the property crash in 2008 in fact. However the question I constantly ask (myself as much as anyone) is, if this were a real issue then how come it could continue to be a real issue 6 years later? I wonder if this issue is as much a function of available data as an intrinsic problem. Prior to 2008 there was no available data on inventory or new listings - the supply side data of the property market. Up until that time the only available data on the property market was transaction data on sales volumes and prices. Then in April 2009 Realestate.co.nz published the first NZ Property Report covering the market in March 2009 looking back 15 months to January 2007. This report provided a whole new set of data particularly centred around new listings and inventory as well as asking price. The data set of the NZ Property Report covered the period from January 2007 as this was judged the most accurate starting point, due to the fact that the database for the website was truly reflective of the whole market from late 2006 - the inaugural year of the website. The problem is that without data from say the nineties and early years of this century we have difficulty in accessing what a normal market was, as 2007 was the last of the froth of the property market before the crash and subsequently the market has moved into very different modes over the past 6 years. I thought I would look at the core data and see what components are valid and what we may be able to shine a light on to see a clear picture of the market to be a true indicator of trends and to answer the question as to whether there is a shortage of property for sale. The actual level of available property for sale on the market over the past 6 years has not changed that much. It has been as high as 53,000 properties and as low as it is today at 39,000 properties - but then at 39,000 properties that is nearly half of the total current annual sales. Certainly buyer and real estate agents would love to see more properties on the market, but 6 months stock is a pretty good level and in relative terms the availability is pretty consistent. The supply side data of inventory and new listings, takes on a greater relevance when assessed against the rate of sales through the addition of the monthly sales data which provides a greater contextual insight. This chart whilst a little confusing with dual axis tries to capture the key data sets and align them to provide insight. Inventory as per the previous chart is measured in actual monthly levels in the grey area at the base of the chart. The red and blue lines measure listings and sales respectively - both are reported on a moving annual total basis. This method of reporting removes the seasonality, so much a component of property data. The take out from this chart is the almost flat level of new listings coming onto the market over the past 2 years - steady at around 130,000 per annum. Whilst at the same time sales have risen over the same period from an annualised total of 55,000 to 80,000. This shows clearly the component of demand in the market. That demand has not driven more listings to come onto the market despite all the communications from within the real estate industry and yet despite this, inventory has not actually fallen that drastically. This indicates more of a 'liquid market' where sales occur more quickly. These charts which to me provide insight I know are to many confusing and I have been looking for ages for a simpler indicator of the overall sentiment of the market in regard to supply and demand - something that better answers the question as to the pace of the market and whether there is a shortage of supply. I will note here that I hold the view that price is a lagging indicator and as such tracking the market sentiment of supply and demand will provide the key to future trends in price. I recently saw this chart from the UK property market showing actual inventory (green bars) matched to monthly sales (blue line). It got me thinking that this measure had relevance tracking the effective rate of sales each month as a proportion of the available stock. Producing this chart for the NZ market shows somewhat of a different chart. The seasonality of home sales in NZ seems far more pronounced than in the UK and therefore it is harder to determine easily a trend, whereas I would judge that there are key trends easily determined in the UK data - significant rising sales in the past months matched to falling inventory. So how to present this data in a meaningful and simple way was the challenge, as I sensed the data contains the core insight needed. Especially at this time where I see the property market slowing and a lack of inventory is not the real issue or the driving factor. It came to me! - inventory and monthly sales - what we are really looking at is "Property Clearance Rate" - what percentage of the available stock of properties on the market in a month are sold in that month. A quick analysis produced this chart which shows the ratio of sales to inventory. Again the seasonal volatility makes it hard to see a trend - the dotted line is a trend line overlaid, but as we all know applying a different fundamental equation to the trend line could produce a different picture! Then it came to me - take the 12 month moving average monthly sales and apply it as a percentage to the available inventory and I think we have what to me is a very relevant picture of the NZ Property Market. Now I could be guilty of endlessly seeking data to fit a story, but in my mind this is a visual of the property market that to me makes sense. It uses the current rate of sale (adjusted to remove the seasonal fluctuations and short term movements), combined with the available stock which is itself the function of existing unsold inventory, new listings and sales. The telling image from this chart is the sharp rise in the clearance rate once the property market got into gear around 2011 - that rise, from 9% to 19% speaks to the dynamic market we have seen over this past two and a half years. However what this chart graphically shows which I have sensed is that the market has turned. It turned even before we saw the LVR restriction introduced in October as this chart shows the turning point in August / September of last year and the latest data from REINZ on sales in March only reinforces this fact. So in my opinion given this declining clearance rate is the key trend and talk of a shortage of properties for sale is nothing but a red herring! The latest NZ Property Report released today by Realestate.co.nz for the month of July for the first time in what seems like an eternity shows that the pressure in the property market caused by a shortage of listings may be easing. In July 9,857 new listings came onto the market, which compares with 9,411 in July last year. Not much of an increase you might well say but given the fact that the past 5 months have all seem lower numbers than a year previous – it is good to see greater choice. This increase in new listings however did not actually increase the available stock on the market. At the end of June there were 37,615 properties on the market, by the end of July that had fallen by 1,383 to 36,231. However available stock of property on the market is not the true test of the state of the property market; for that you need to look at the rate of sale. For June the sales on a seasonally adjusted basis were down from 6,748 to 6,217. So with an increase in new listings matched to a slower sales, the inventory as measured by the number of weeks of equivalent sales actually rose in July. The Property Dashboard for July shows a level of 26.7 weeks - still placing the market firmly in favour of sellers but some easing does bring some hope for buyers. Across the country the picture reflected the national trend with 9 regions experiencing a sellers’ market as compared to 13 last month. For the first time for quite a while one region – the West Coast of the South Island is showing a buyers’ market. Property markets move in cycles. The current market is firmly established as a sellers market. This current state is widening, in the sense that the total market when seen by region is gradually migrating in the direction of more and more favouring sellers. In order to present this analysis of the market I have created a series of 4 charts which show the picture of the NZ property market by region for each of the past 4 years 2010 - 2013. I have used the measure of inventory as presented by the NZ Property Report from Realestate.co.nz which each month assesses the market in each region measuring the available inventory of property on the market and dividing it by the average weekly sales for the past 3 months using the REINZ sales figures. This computation generates an inventory; not as an absolute number, but as an equivalent stock in number of weeks based on the current rate-of-sale. I very much favour this approach as it reflect the key driver of the property market which is supply matched to demand. As sales increase and inventory is slow to respond, as has been the case for the past two years the inventory measured in the number of weeks of equivalent sales falls sharply. These monthly statistics of available inventory drive the Property Dashboard which is presented by Properazzi each month in the form of a barometer of the market visually showing the degree to which each region of the country is experiencing a buyers or sellers market. The four charts presented below present the inventory at June 2010 / June 2011 / June 2012 and June 2013 and clearly show the trend. The trend which over the 4 years has seen a situation where in 2010 4 years ago, all but 4 of the 19 regions were in a balanced or buyers market to where today in 2013 only four regions are in a balanced market with none favouring buyers and the majority in a moderate or extreme sellers market. 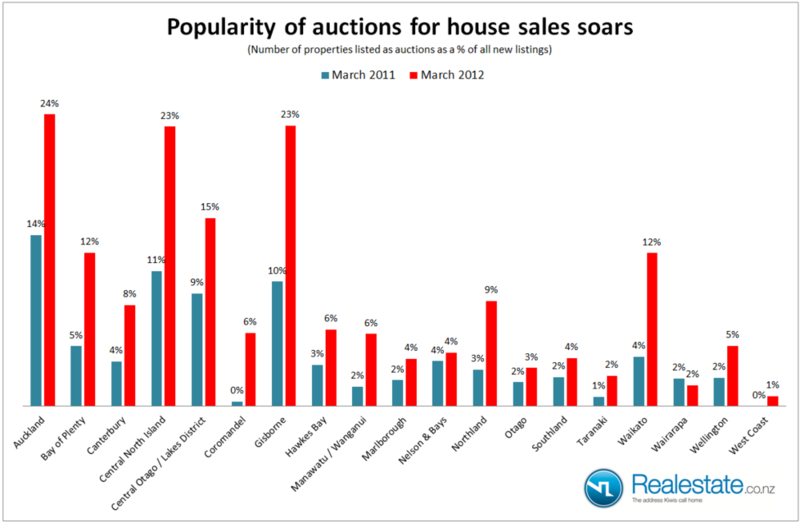 Auctions causing buyer frustrations – I blame technology! As someone who has spent over 7 years advocating the adoption of technology by the real estate industry in NZ, I must now adjust my position and state that I believe that it is technology that is frustrating buyers in the stressed Auckland property market. The stories have become so commonplace that I sense we feel like we have almost been with these buyers in some vicarious way at their endless frustrating auction. The young couple with the necessary deposit and pre-approved mortgage eagerly awaits the auction of their chosen dream home. The research tells them that the property is within their means with a maximum budget of $475,000, the property has a CV of $410,000 and the agents tells them that at their budget they should certainly be bidding. However the bidding exceeds their budget with the property selling for $585,000. So what’s going wrong and why blame technology? Simply put the web is the first and only place people look for property. It’s logical, buyers love the ability to search around their chosen parameters of location, size and price. However the greatest attribute of the search process turns out to be its greatest downfall – the search range of price. Take this scenario of our hypothetical couple – they have a budget with a max of $475,000 so on Trade Me and Realestate.co.nz they search within their chosen suburbs with the range of $400,000 to $500,00. Website have price bands of $100,000 increments (Trade Me does have $50,00 increments up to $450,000). Their dream home came up in this search because the agent had included in the property details sent to Trade Me and Realestate.co.nz a 'Non-Display" search price of $500,000. The property was being marketed as an auction and therefore the agent did not want to display a price on the website, but it is mandatory for all listings on property websites to have a search price which is not published to power the search function. It is my view that these wide price ranges are creating a false expectation amongst buyers and potentially misleading the public. To back up this view I have done some research to test my thinking. I took a random sample of 10 properties on the market today, all marketed as auctions in Auckland City. These properties were in suburbs such as Onehunga, Mt Wellington, Mt Roskill, Blockhouse Bay and One Tree Hill. All properties were identified through the search price range of $500,000 to $600,000 being the average property price in Auckland today. I then went about undertaking a process to identify the exact search price or search price range for each property as inputted by the listing agent. To do this you need to use the Advanced Search feature on Realestate.co.nz which allows you to specify your own chosen price range in increments of a dollar; by doing this I was able to see at what price these properties appear or disappear from results. Also for reference and a sense of benchmarking (despite my dislike for CV’s) I got the Auckland City Capital Value for each property. The results of this analysis were very interesting. Eight of the ten properties had a single search price inputted by the agent. The search price as compared to the current CV varied widely from 3% below the CV to 47% above the CV. The average was 23% above the CV. However the thing that was most interesting to me, and what could potentially be construed as misleading, was the way these property appeared in a wide range of search results based on price ranges. Remember all of these properties appeared in the search range $500,000 to $600,000. Property #1 with a CV of $470,000 appeared in all 3 searches from $400,000 to $700,000 as the agent had specified a search range of $500,000 to $600,000. Three properties (#4, #5, #7) with CV’s from $410,000 to $440,000 appeared in the range $400,000 to $500,000 – all had a search price by the agent of $500,000 so clearly the agent was indicating a sales price of over $500,000 yet if you had a budget of say $425,000 these 3 properties would appear to be within your range. Property #6 with a CV of $620,000 appeared in the price range of $500,000 to $600,000 as the agent had chosen a search price of $600,000, yet clearly the expectation was a selling price of over $600,000. It is clear that the current wide price range search parameters could be leading to misinterpretation by buyers. To fix it the websites concerned could offer more options with smaller price ranges, as noted Realestate.co.nz in their advanced search function does allow for individual discrete price ranges to be entered. However there is a simpler solution. Real estate websites could make a slight adjustment to the underlying code of search results so that search increments become $99,999 instead of $100,000. This would mean that when a search is made in the range $400,000 to $500,000 it only returns property with search prices between $400,000 and $499,999, thereby ensuring that a property for which the agent has selected the search price of $500,000 will not be found in such a search. In that way technology could help home shoppers match expectation to realistic budget better. Close to 1 in every 5 properties do not have an accurate address! This is a simple fact - yet it would seem unbelievable to discover that there are over 8,000 properties for sale today in NZ for which the agent listing the property does not provide an address. There are 62,852 properties (including sections) on the market today as detailed by Realestate.co.nz all of which are being marketed by licensed real estate agents. On the mobile app the total of properties with an address only amounts to 47,521 - that is only 75% with an address! Now I concede that when it comes to sections mapping an address is a problem so let's be fair and exclude sections. Removing the 18,105 sections results in a total of 44,747 physical properties on the market with only 36,698 of them being presented on the app with an accurate address - that is 82%. It seems unbelievable to find that in today's world when so much property searching is done on mobile devices that an agent who is not accurately presenting this data to the portals of Trade Me and Realestate.co.nz is not doing their job in providing a professional service to their clients. The fact is without an accurate address means that their client's properties will not be discovered by active buyers using these apps. Total sales by auction growing by more than 66% and in Auckland 40% of sales as auctions! I found these numbers surprising and somewhat hard to believe. The REINZ has only recently been reporting sales by pricing type and I wondered if their data was inaccurate. The reason for my concern was prior data reported by Realestate.co.nz of earlier in 2012. At the last period of reporting being March 2012, the number of new listings marketed as auctions was 13% nationally and 24% in Auckland. The data as presented below also showing the make up of auctions a year earlier in March 2011 by region of the country. Could the representation of auctions in the marketing of property in Auckland have really risen from 24% in March to over 40% in December? Unfortunately I do not have access to the data warehouse of Realestate.co.nz but the website does provide an easy way of counting listings by date and also by price type. Analysis of the numbers for just new listings coming onto the market over the first 17 days of January is quiet surprising in my mind. Across the country in 17 days of the 3,621 new listings, just under 1 in 5 (673) were marketed as auctions, in the case of Auckland 424 properties were marketed as auctions out of 1,069 new listings - 40%. 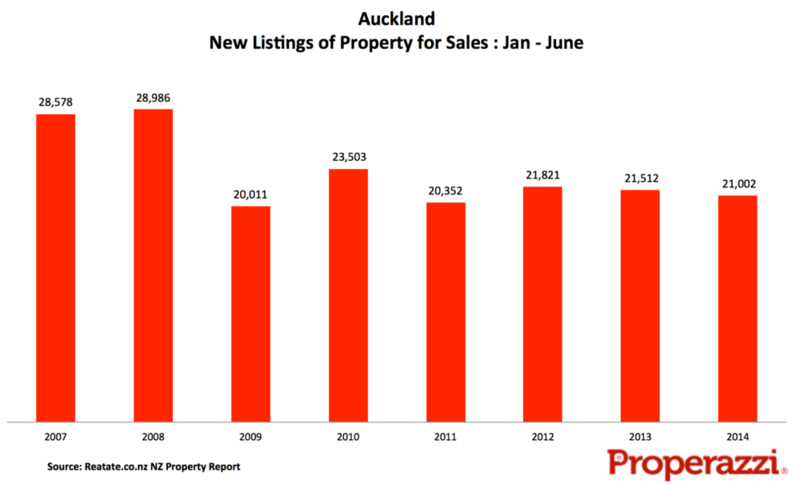 I am amazed at the extent to which auctions have taken off in the past year in Auckland, going from 1 in 4 of new listings in March 2012 to 2 out of 5 just 10 months later. Clearly the market is far more dynamic and property is selling fast and as a consequence agents are recommending this method of sale - the REINZ data is bang on, auctions are a key development in the NZ property market. The property market certainly responded to a long overdue call to restock inventory levels of properties for sale. For the past 18+ months the message has been clear – there is a seller’s market, which has been continually building, and despite the numerous media reports, home owners considering selling seemed to have been overly cautious about responding to this demand from buyers. In October though it seems the response has been heard and the action taken - let's list! This assessment of the state of the market is provided via the excellent data released each month by Realestate.co.nz in their monthly NZ Property Report. The report is the first data of the month being released in the first few days after month end and provides insight into the supply side of the market – a unique set of data collated as a result of the website hosting close to 100% of all listings by licensed real estate agents. The data in the report is comprehensive and the charts provide a great insight, as ever though I am keen to explore new methods of presenting the data and as the original author of the NZ Property Report I though I would analyse the data to see how additional representation of the data could help home shoppers better appreciate what is going on. The main perspective I was interested in was how each region of the country was performing as compared to the national trend and each other region. This process lead me to these three charts below which I think ably reflect this desire. In terms of inventory the national perspective is that inventory levels remain low – they are 16% below the long term average which supports the view that we are experiencing a sellers market. However this is not reflected across all regions. There are 7 regions where inventory is above the long term average making these buyers markets, with Gisborne and Taranaki having considerable inventory based on the current rate of sale. At the other extreme it is very evident to what extent Auckland continues to witness very low inventory and maintain its market situation favouring sellers. When it comes to new listings the strength across the country is very clear – nationally based on seasonally adjusted data new listings were up 4% in the month with the majority of regions seeing strong rises with only Marlborough being the outlier with a 20% fall in new listings. In regard to property asking prices the seasonally adjusted asking price for new listings in October rose 4% in October and only 4 regions saw falls in asking price with a very strong surge in Central Otago / Queenstown lakes district as well as Canterbury. Disclosure of interest in that I used to be CEO of Realestate.co.nz, although I no longer have any affiliation or financial interest in the business – just a passion to see it continue to provide open property data and deliver a great user experience to home shoppers. The September report from the Real Estate Institute showed a fall in sales between August and September this year which contrasts with a seasonal rise. Whilst not citing low listings as the cause, the report certainly spoke to the impact that the low level of listings was having on prices. In the same week the monthly NZ Property Report published by Realestate.co.nz continues to report low levels of inventory. Both of these reports set the scene for what could be a challenging time for the property market heading into what is traditionally the busiest time of year with what many consider very low levels of available stock. The key questions is -- Is there sufficient stock of houses to buy? I think it is very important to look behind the headlines and look at the numbers and the source of the numbers to truly answer the question. Inventory of unsold houses on the market and number of listings of property on the market sound much the same - however they are as different (albeit in a subtle way) as speed is from velocity (for all those that can recall their physics lessons at school!). The number of listings on the market is very clear - its actual houses, houses you can see and check out. Inventory on the other hand as reported through the NZ Property Report is a more complex and advanced measure. It is in its own way a vital measure. It is a measure of the available inventory measured by the current rate-of-sale of property. So to say that the current inventory in NZ represents 30.5 weeks, means that based on the rate of sales in the prior 3 months of June, July and August (1,441 sales a week) it would take (theoretically) 30.5 weeks to sell all of the available stock of listings on the market which at the end of September was 44,063 listings. To assist in understanding these two measures and better appreciate the true perspective of the market, have a look at this chart which tracks stock of listings and inventory across the country over the past 5 years. The red line (tracked on the right hand axis) measures the inventory, whilst the grey bars (tracked on the left hand axis) measures actual stock of listings. A key takeaway here is that at the height of the property crash the inventory of unsold houses on the market back in 2008/9 reached 60 weeks, today it is half that level at 30 weeks. However at that low point in market back in 2008/9 the actual stock of listings was just over 50,000 whereas today it is just over 40,000. That is the point; inventory has halved but there is still a lot of choice in the market with only 20% fewer listings. Now I know there will be those who will say that the national figures are not relevant and what matters is how many houses there are in this suburb or that suburb. Those comments are both right and wrong. People do buy houses in an area and there are certainly less available property in certain suburbs than there were 3 years ago - but in someways there are always a limited pool of available properties as properties are not homogenous - we are all looking for that unique combination of features in a certain location. So to say that there is an acute shortage is alarmist. In the Auckland region the inventory at the worst of the property crash the inventory peaked at 60 weeks, today it is hovering below 20 weeks, that's a massive decline - however available stock of listings at the peak was around 15,000 whilst today it is around 9,000. Now that is a significantly lower level of available stock, but to call it a shortage?